The small town of Howick is situated in the KZN Midlands along the popular Midlands Meander tourism route. Howick offers a wide variety of antiques, arts and crafts, and entertainment venues which include art studios, country hotels, herb and flower farms, guest houses, tea gardens, country pubs, health hydro's, craft, pottery and weaving workshops, breweries and wine barns. Howick features some quaint historical stone buildings, such as the library on the main street and the Bell Inn. The town's main attraction is Howick Falls. The spectacular sight of the Umgeni River as it plunges 100 metres over dolerite cliffs to the gorge below, is an unforgettable experience. The waterfall was known as kwaNogqaza or "The Place of the Tall One" by the original Zulu inhabitants. Being the focal tourist point in Howick, the area around the Falls is sprinkled with a host of curio and craft outlets and open-air restaurants and cafes, where visitors can enjoy tea and scones under shady oak trees. 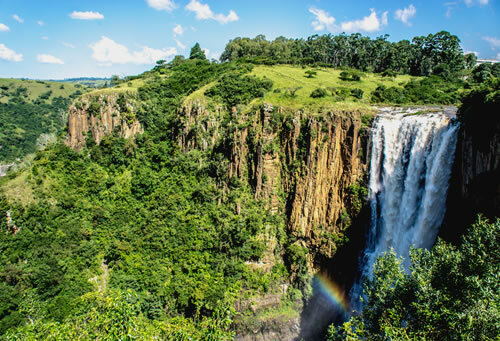 For energetic visitors to the area there are the Howick Falls Gorge Walk, the Umgeni River Trail, and the Beacon Hill Trail all of which stretch over the duration of about an hour, depending on how much time one allows to stop and take in the picturesque scenery. The Howick area is also a popular destination for fishing, with the nearby Midmar Dam setting the scene for various angling competitions, and a multitude of other watersports. The Midmar Dam Nature Reserve with its 1000 hectares of game park is home to a variety of antelope including red hartebeest, blesbok, reedbuck, black wildebeest, oribi and zebra, providing excellent game viewing and bird watching.